Retrace the events of D-Day from London to Normandy to Paris. 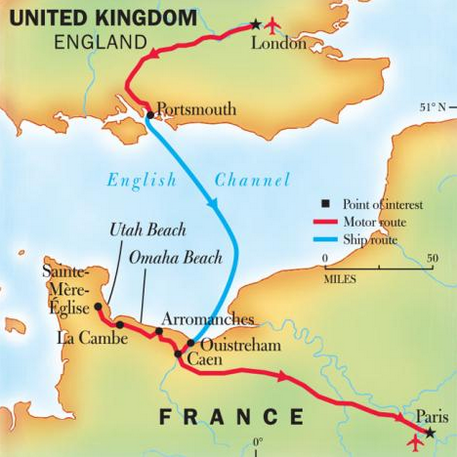 Follow the path of the Allied forces from Portsmouth, England to the shores of Normandy, France. Step back in time at important World War II sites in London. Then cross the English Channel, delving into the poignant events of June 1944 with a military historian. Stroll the legendary beaches including Canada's Juno Beach and Juno Beach Centre, the cratered cliff-top at Pointe du Hoc, and visit villages that still bear the vestiges of war. This is an America-centric tour, but does include Canada's Juno Beach and a unique, London DDay portion of the tour other Landing Beach tours do not. A military historian joins our expedition, providing expert insight on the logistics of the Allied assault on Normandy. Walk along the infamous Omaha beach with a local historian, and get an in-depth perspective on the historic coastal landings and air invasion by American and Allied forces and visit UK and Canada's Juno Beach. Get a behind-the-scenes look at Normandy’s artillery batteries, and stand inside the German gun pits on Pointe du Hoc. Throughout the trip, we stay in ideally located, high-end hotels with many amenities. A National Geographic expert accompanies each departure to share insights and a rare behind-the-scenes perspective, and local guides join us along the way. The May 30-June 7, 2019 and June 2-10, 2019 are 9-day programs and include a day at the June 6th DDay Anniversary commemoration ceremony at the Normandy American Cemetery and Memorial. Other departure dates follow a slightly different itinerary with most of the same elements except Anniversary commemorations. Some departures are already waitlisted – book today to ensure you are on the ground in Normandy on the 75th anniversary year of DDay! Upon arrival in London, check in to our centrally located hotel. The afternoon begins in the Churchill War Rooms, a fortified bunker deep underneath Whitehall from which Winston Churchill directed the British war effort. Wander through the rooms—and the adjacent Churchill Museum—and examine maps, telephones, and items from Churchill's life. Following our tour, enjoy a welcome reception and dinner in the Churchill War Rooms. Set out on a tour of London’s highlights including Buckingham Palace, Westminster Abbey, and Trafalgar Square. Explore the decks of the H.M.S. Belfast, now part of the Imperial War Museum; and visit Norfolk House, where much of the planning for D-Day took place. This morning, immerse yourself in a world of intrigue and espionage at Bletchley Park and discover the story behind the Enigma code breakers, who successfully deciphered the encryption used by the Wehrmacht. Later, travel south to Portsmouth. At the D-Day Museum, examine the Overlord Embroidery—a stunning handcrafted depiction of the D-Day events that stretches some 270 feet—and see a replica of the map General Eisenhower used to plot Allied positions. Later, take a tour of Southwick House, the former headquarters of the Allied commanders. This morning, cross the English Channel by ferry. Visit the Pegasus Memorial Bridge and Museum—dedicated to the men of the 6th British Airborne Division. Then walk in the footsteps of thousands of soldiers at Juno Beach and Gold Beach, two of the five landing points for the Allied invasion. Take in the German artillery battery at Longues-sur-Mer, built by the Wehrmacht at a strategic point overlooking the English Channel—and later disabled by Allied bombardments. Explore the village of Sainte-Mère-Église, where the 82nd and 101st Airborne Division paratroopers dropped from the sky in a hail of gunfire on the night of June 5. View the church steeple upon which one unlucky paratrooper was entangled for hours, and visit the village's remarkable museum. Continue west to La Fière bridge, site of an important D-Day battle led by the 82nd Airborne Division. Visit a memorial established in memory of the 506th Parachute Infantry Regiment of the 101st Airborne Division—known as E or Easy Company—which eliminated a German artillery position at Brécourt Manor during a pivotal moment in the invasion. Then venture into the field where Easy Company Commander Thomas Meehan and his crew perished when their C-47 crashed under enemy fire—an event dramatically recounted in Stephen E. Ambrose’s Band of Brothers. After lunch, explore Sainte-Marie-du-Mont, one of the first villages to be liberated in the D-Day invasion. Continue to Utah Beach, site of one of the two American amphibious landings in the early hours of D-Day, and take an afternoon tour of its museum. Begin the day with a visit the 11th-century Cathedral of Bayeux, a gem of Norman-Romanesque architecture, and see the Bayeux Tapestry. Then explore one of the most dramatic sites along the Normandy: Pointe du Hoc, where U.S. Rangers used hooks and ropes to scale cliffs some 100 feet high in order to destroy key German gun positions. Walk along cliff-top pathways still cratered by mortar blasts, and venture into the concrete bunkers from which German forces unleashed a barrage of artillery fire. Wander along Omaha Beach, site of the bloodiest fighting of the invasion day. Trace the history of the Vierville Draw, which was a German stronghold and an important objective for Allied forces to clear, and see remnants of German bunkers and fortifications along the Atlantic Wall. At the American Military Cemetery in Colleville-sur-Mer, pay your respects to fallen heroes by laying a wreath. Take in the poignant sight of row upon row of small white grave markers stretching across acres. On the 75th anniversary of D-Day, attend a commemoration ceremony at the Normandy American Cemetery and Memorial overlooking Omaha Beach. In attendance will be surviving WWII veterans, heads of state, senior military officers, and other dignitaries. This afternoon, drive to Paris and gather for a farewell dinner. After breakfast, transfer to Paris’ Charles de Gaulle Airport for your flight home. Prices are per person based on double or single occupancy (unless otherwise noted) and do not include international airfare to/from your destination. All prices and fares are quoted in U.S. dollars and subject to change. See the terms and conditions for this trip for more information. Known for it's historically acclaimed architectural and horticultural structures, Normandy is a popular destination when visiting France. Normandy's museums, memorials, concert halls, chateaux and manors, national parks and culinary culture are designed to pay homage to Norman architecture of England after the Normand Conquest of 1066. The culture and structure of this beautiful French region are sure to appeal to all tastes. Visit Juno Beach on this Normandy, Brittany & Châteaux Tour by Globus – Book by April 30 and Save!